The drug that killed Prince is slaying people at a rate of nearly one a day in Ohio’s capital city. Fentanyl has already figured in 55 fatal drug overdoses in Columbus and surrounding Franklin County in January and February, the local coroner reported Friday. “The headline is that this is almost half the total number of fentanyl-related deaths we logged all of last year,” Franklin County Coroner spokeswoman Tia Moretti told NBC News. And at this “unprecedented” rate, Moretti said, Columbus is poised to rip up the local record book as a drug that has cut like a scythe through much of Ohio wreaks havoc on the buckle of the Buckeye State. “This is killing us,” Moretti said. Fentanyl is a powerful painkiller that the U.S. Drug Enforcement Administration says is 25 to 50 times more powerful than heroin and packs 50 to 100 times more punch than morphine. One of the strongest opiates on the market, it’s often prescribed post-surgery and it is so addictive it turns normally law-abiding people into criminals who will do almost anything to score more. 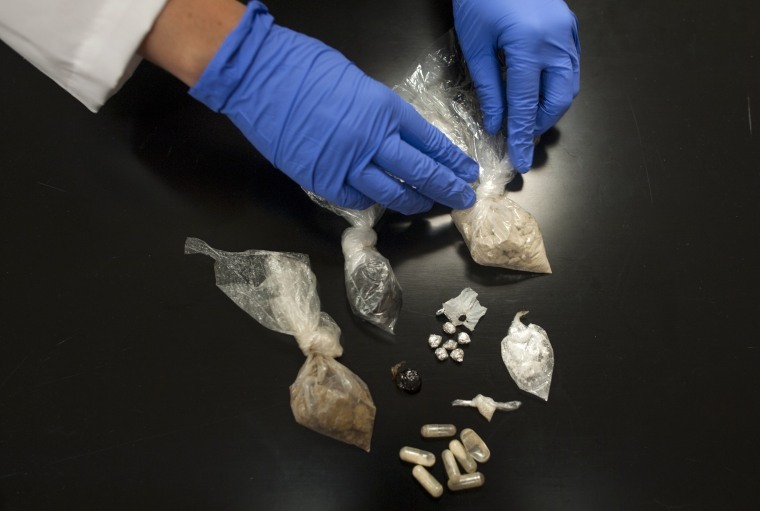 Typically, dealers cut heroin with fentanyl to boost profits and give it more kick. But more and more, investigators are finding it in marijuana and other drugs, Moretti said. Moretti spoke out after the Franklin County Opiate Crisis Task Force met to come up with a strategy to combat a plague that has ripped across much of the Rust Belt. The group is expected to come up with recommendations in about a month. “We’re not running out of space for bodies, but what’s happening here is happening all over Ohio,” she said. Is it ever. The drug overdose rate in Ohio was 29.9 per 100,000 people in 2015, the most recent federal figures available. This week, NBC reported that in Stark County the local coroner had a “cold storage mass casualty trailer” trucked up from Columbus to store bodies after they ran out of space in their morgue. Nearly half of those bodies were drug overdose victims. The chief culprit in Stark County appears to be a tranquilizer called carfentanil that is 100 times more potent than fentanyl and used to sedate big animals like elephants and tigers. Coroners in the counties of Ashtabula, Cuyahoga (where Cleveland is located) and Summit (where Akron is located) have also had to resort to storing bodies in trailers because their morgues were too jammed. Sadly, Ohio is not alone in dealing with a deadly opiate epidemic. West Virginia, New Hampshire and Kentucky have even higher drug overdose death rates, according to the federal Centers for Disease Control and Prevention. And cities like Wilkes-Barre, Pennsylvania saw an explosion in the number of deadly overdoses after drug dealers began peddling heroin cut with fentanyl. Prince died last April of an accidental overdose of fentanyl. He was being treated at the time for opioid withdrawal, NBC reported.